It’s official, you no longer have any excuses for not tracking your money. I’m not talking about using clunky (and costly) desktop software like Quicken and Microsoft Money. Plus, no one wants to type in or categorize all their transactions. Mint is a well-designed web app that automatically aggregates financial data from all your various online financial services. It imports, categorizes, and presents you with an up-to-the-minute snapshot of your finances. It’s so simple. Your entire financial life in one interface. If you want detailed budgeting you may have to stick to a more traditional solution. However, if you take the cost of your time into consideration, I believe that Mint will give you the best return on investment. I tested Mint when it was first released in September, 2007. At the time it was innovative, but lacked some of the features I wanted. 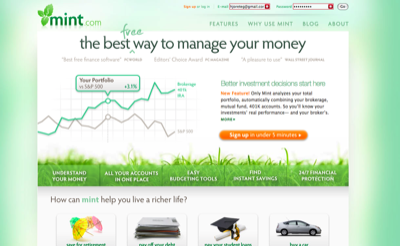 Today, Mint has matured into a very useful tool with a much-improved interface. Try it out, knowing where your money goes is the first step to getting your finances on track. You’ve got nothing to lose. Go sign up now. It’s quick and painless.